Edge Kazbek Large safety glasses are approximately 20% wider than the original Kazbek safety glass, making them great for larger faces. Kazbek is the perfect safety glass whether you're hammering away at concrete or bombing down the trail on your bike. The Kazbek features "Edge-Flex" temples that keep your glasses secure and comfortable and offer shock absorbing support from the temple to the ear. 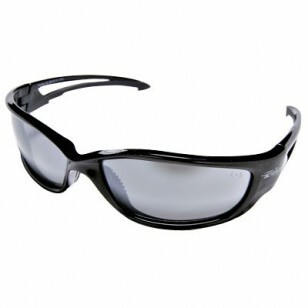 Polycarbonate lens provides 99.9% protection from UVA/UVB/UVC sun rays and are scratch resistant. Lenses: Silver Mirror - Reduces glare, commonly used in outdoor applications.